"I saved three person-months of development time using Iron Speed Designer." 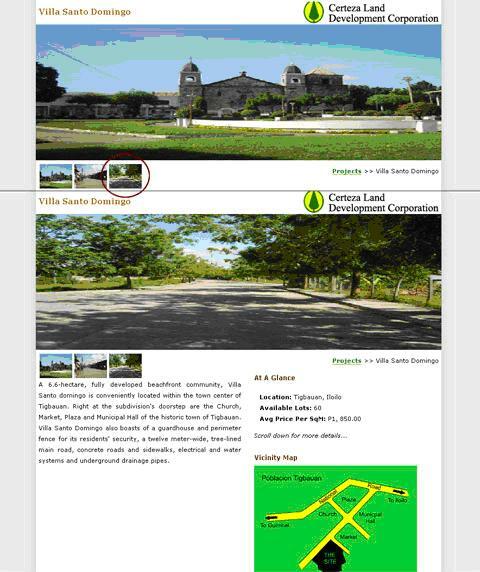 The Dynamic Land Sales website was developed for Certeza Land Development Corporation, a real estate development firm in Iloilo City, Philippines. To date, they have developed approximately 17 housing subdivisions, often referred to as villages. Over 10,000 people access their website each month! The Dynamic Land Sales Site Manager, the administrative portion of the website, was built with Iron Speed Designer. The application allows the business owner to maintain the corporate website without hiring a full-time .NET web developer. It manages development projects, tracks prospective customers, and maintains existing marketing campaigns. The information managed in the ProjectsInfo tab is displayed on the main Projects page and its sub-pages. 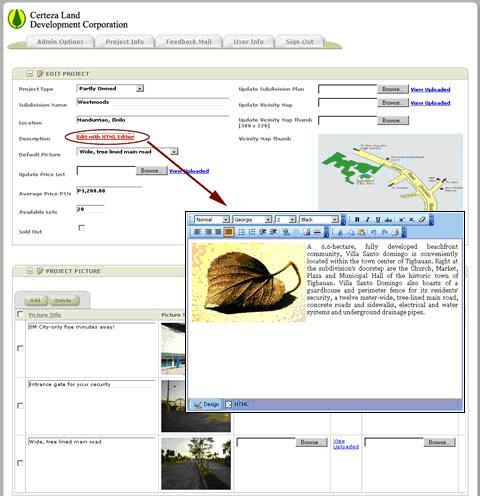 Upon logging into the Dynamic Land Sales site manager, the user can apply changes to the Dynamic Land Sales website. The user cannot alter the layout of the administrative application itself. Users can add new development projects to the central part of the website, or update an existing project by accessing the Project Info tab. The term "project" refers to a new housing subdivision. Each project includes a map, a subdivision plan, and at least one primary image which is displayed on the website's project page. A user can select the primary picture for a project from a pre-populated drop down list in order to edit an existing project. Since an image is required for each project, a default picture is shown on the website when no primary picture is selected. Users can click on any thumbnail image to change the default picture display. The application uses a third-party HTML editor to format text for various elements of a subdivision profile, including the project description, company profile, and other services. The application organizes the projects automatically by project type, which is determined by the site administrator when adding new projects. The project type can be "part owner" or "contract". 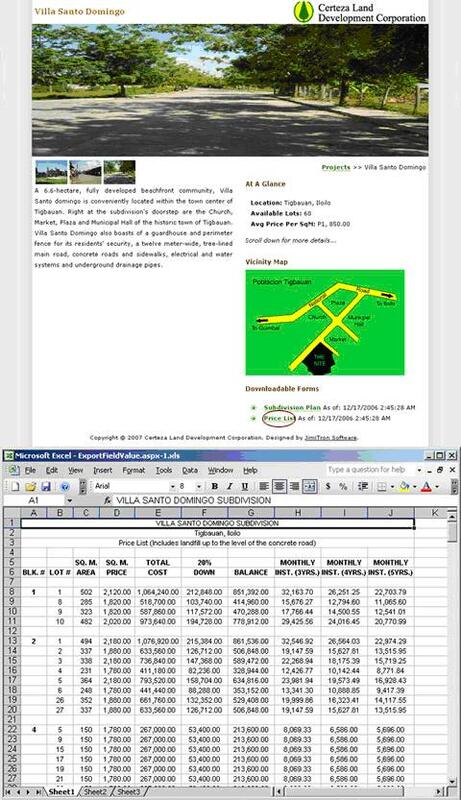 The website also maintains a timeline for each subdivision plan; so, for example, when a price list is updated, the date is shown on the website. This update is applied automatically when changes are made to the database. 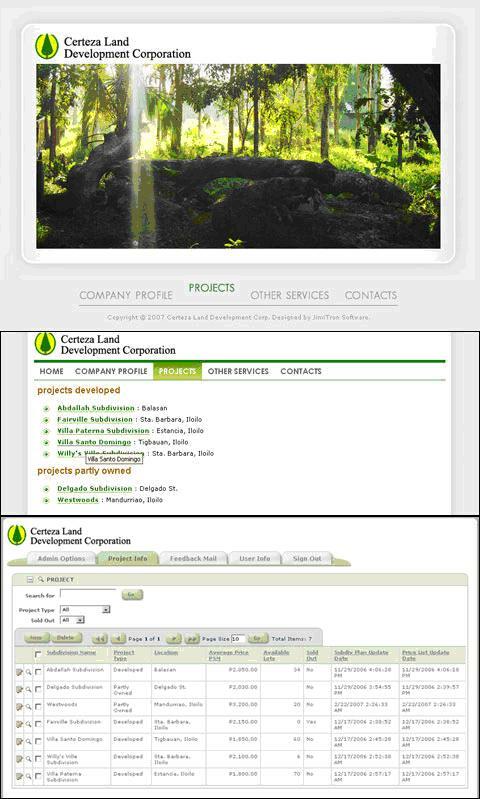 Internally, application users can send emails to other Certeza Land employees as well as to external customers. Emails sent through the website are stored in the database as a back-up. These emails can be viewed and sorted by subject, sender or date, making it convenient to manage large amounts of information. The Dynamic Land Sales application utilizes one Microsoft SQL Server 2005 database and is comprised of 25 tables and views. The tblLots table is the largest consisting of 3,000 rows, and will continue growing as the client takes on new projects. There are currently 10,000 people accessing 48 different web pages, processing 100 transactions each month. This number will increase as the website becomes more established. The initial application was deployed in two weeks by a pair of developers. The Iron Speed Designer portion of the project only took one day including the time spent on layout customizations. Users can format text on the corporate website using the integrated HTML Editor in the application. Date Stamping: Every field changes in a specific table to determine last change. Enhancing Microsoft Excel file display and implementing code to asynchronously open an Excel price list file in the application from the website. Incorporating FreeTextBox, a third-party HTML editor to handle text formatting in various elements of the subdivision and project profiles. Asynchronously open an Excel price list file in the application from the website. Removing redundant built-in buttons in order to reduce page size. Implementing additional panel columns to minimize scrolling in Add Record and Edit Record pages. We used the standard Iron Speed Designer Blue Ridge design theme for this application, incorporating the client's company logo into the application header. I saved three person-months of development time using Iron Speed Designer. Without this tool the project could have taken three or four months. While the project was certainly feasible without Iron Speed Designer, I would not have been as confident that I could complete it by hand in the time allotted.